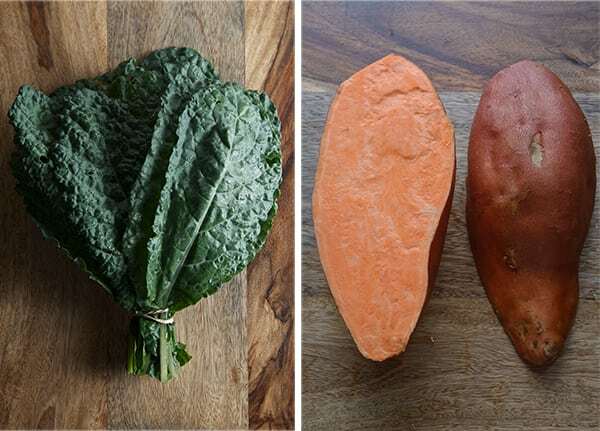 So many Kale… so little time… root vegetables, pumpkins, sweet potatoes, all kinds of potatoes, carrots; an Autumn cornucopia is here and with it Thanksgiving. So gear up! I will be posting side dish appetizers, entrees, and everything with the potential of being on your Thanksgiving table… I think it’s great to add new dishes to the traditional menu, or revamp old recipes. 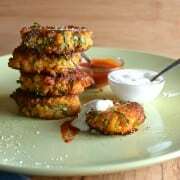 And even if you are not a Thanksgiving celebration type, this seasonal produce is what you will enjoy preparing, whether it’s lunch, or dinner or a simple snak-petizer like this Sweet Potato Kale and Quinoa Fritters. 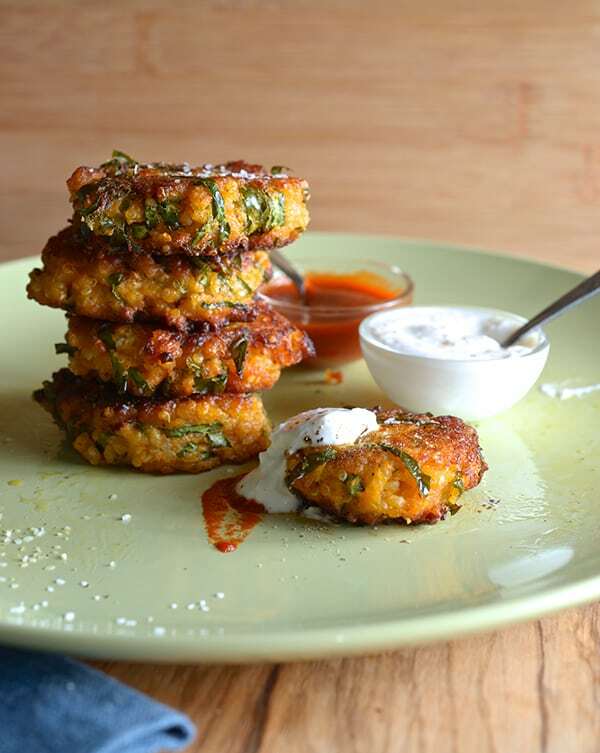 These little fritters are scrumptiously good. 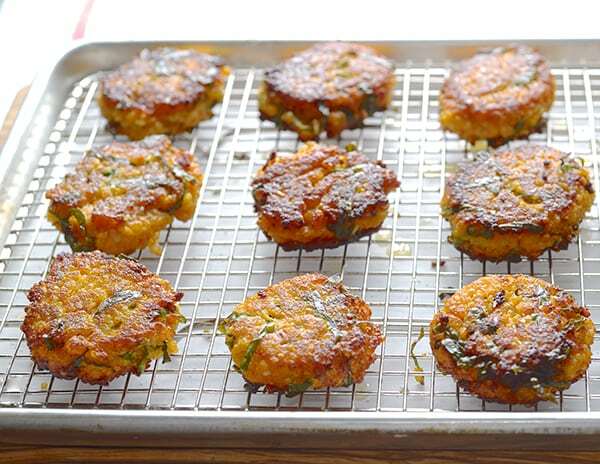 Loaded with vitamins and flavor, this little patties that have a crispy exterior and a soft creamy interior. The quinoa adds texture and a little crunch. 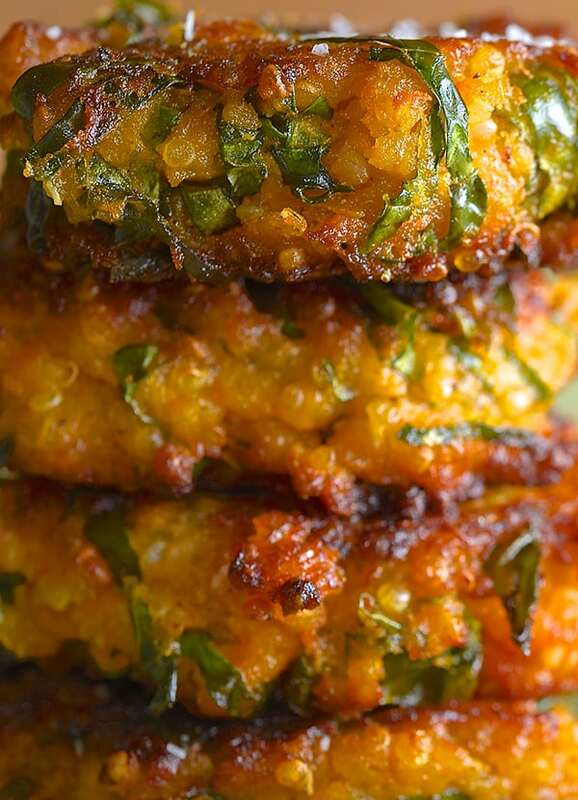 Call them patties, fritters, creatures; you’re gonna love them. They taste equally good when they are warm or room temperature. 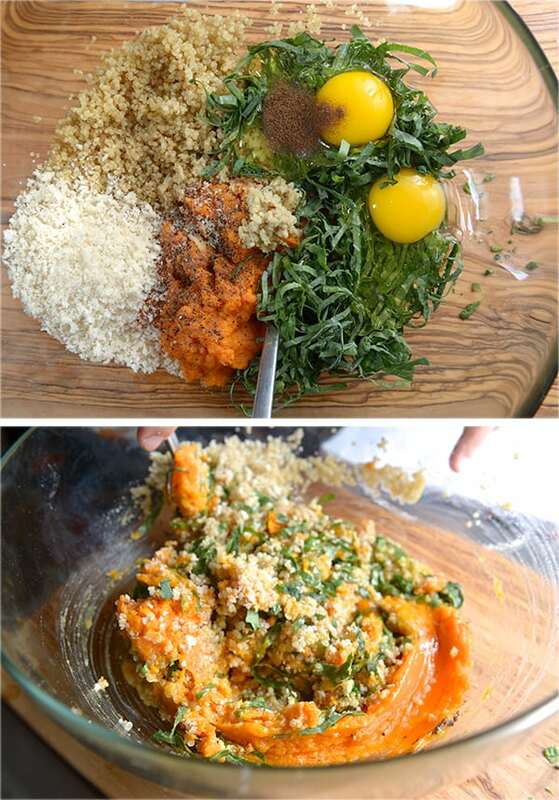 2 cups cooked Quinoa, you can use red quinoa if you prefer. Approximately 1 cup of uncooked quinoa yields 2.25 cups when cooked. 2 cups kale finely chopped. I used Lacinto kale, a.k.a. 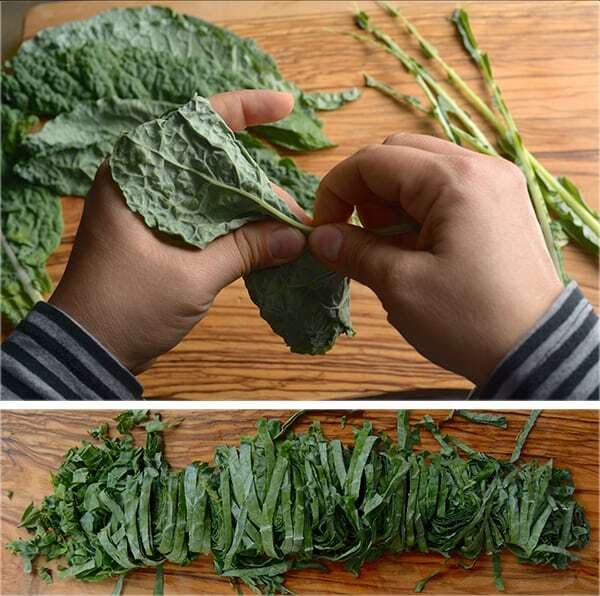 Dinosaur Kale but, any flat kind kale will work. ½ cup panko or any kind of plain breadcrumbs. If you have gluten allergies, ground old fashion oats or almond meal will work. 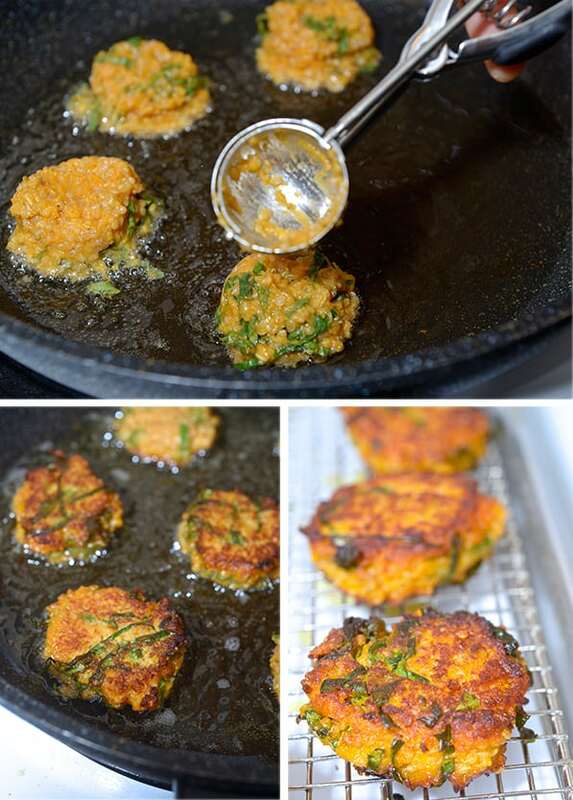 4-6 tablespoons grapeseed oil, peanut oil, or coconut oil to pan fry them. In a small cup mix all ingredients and chill. Hot sauce of your preference. I highly recommend Sriracha Sauce. In a medium size pan heat up about 4-6 tablespoons of grape seed oil, peanut oil or coconut oil. With a small Ice cream scooper scoop about 6 patties into the pan and slightly flatten the tops. Cook for about 3-4 minutes on each side or until golden brown. Serve warm or at room temperature, with the ginger sauce on the side and some hot sauce of your preference. I highly recommend Sriracha…I love it….Enjoy! I Baked them at 375F on a sheet pan lined with parchment. I brushed each patty with some grape seed oil and baked for 15-20 minutes flipping them half way. The results: Texture is more firm and they hold up more like a patty, where the inside is a little more dense. They do not remind me a fritter at all since they have no crispy outside texture. Well you see the results, they really do not absorb a lot of oil, I love love the contrast in textures, crispy caramelized outside, and creamy less thight inside. For me this is fritter. 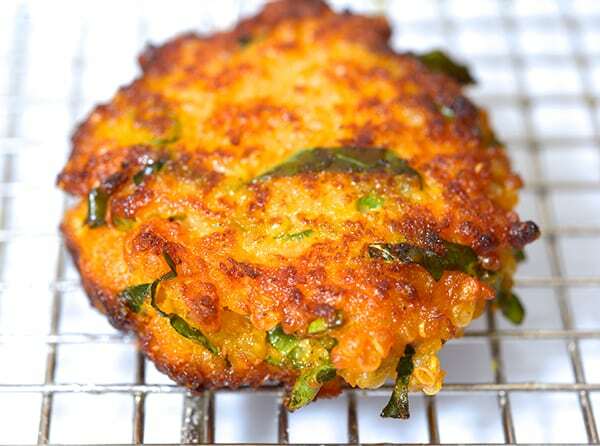 I like them both in their own category… but a fritter its a fritter!